Today we celebrated 4 years of marriage. My wonderful husband took the day off and we treated ourselves to some pampering. We went to Yuan Spa which is just down the hill from us and we were booked for a couples massage and pedicures. I won’t get into the day but when I was shown the range of polishes to choose from, I was shown CND Vinylux and OPI. 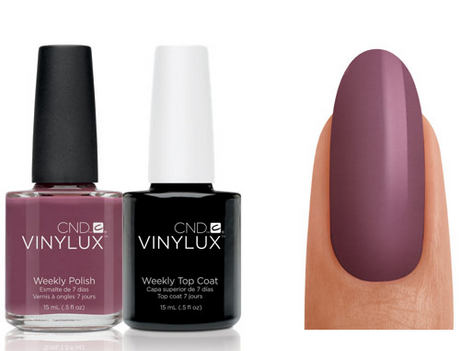 I chose a deep purple color from the Vinylux collection to prepare myself for Fall. I tried to get my husband to get some color on his toes but he wouldn’t give in. Womp. As I sat there watching occasionally (I was dozing off in between from the lovely massage I had) I saw her pick up the color and proceed to start painting my toes minus a base coat. WHAT?! This color is dark! Isn’t it going to stain my nails? I think she saw the look on my face and quickly told me that this new line doesn’t require a base coat, it’s a special formula. And if I bought it, I’d need to get the top coat for it because it won’t work with other top coats. It’s also supposed to last longer. Woah! She applied the top coat after, removed my toe separators, put on my sandals and I was out the door! Btw, this spa uses new tools for every client and you’re asked if you want to keep the file, buffer and orange stick – of course, I said yes! That’s why I was able to hop out of the chair and be off to lunch without my husband having to wait an extra 15 minutes for my toes to dry. So this is where I stand – I need to see how long this lasts and if my nails become stained. In the mean time, I have a new buffer and file to use on my fingernails as they’re in terrible shape.